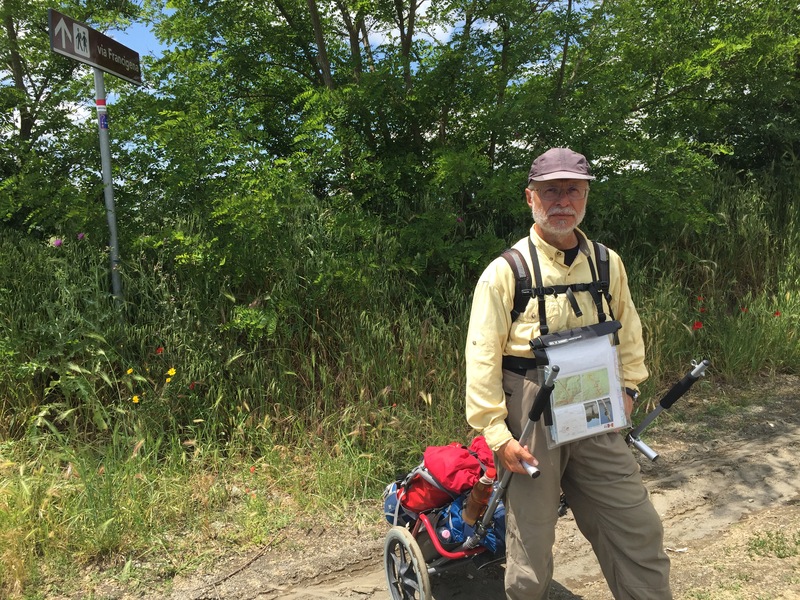 Russell Jackson’s guidebook at the end of his Way of St Francis pilgrimage, as seen in his post on the Way of St Francis (official group) page on June 12, 2016. As The Way of St Francis: From Florence to Assisi and Rome enters the heart of its inaugural pilgrimage walking season it’s been an exercise in joy (and a little worry) to watch pilgrims from all over the world use this new resource as they make their way on the Via di Francesco in Italy. On our Facebook group — which has become a gathering place for over 400 pilgrims to share questions and stories about their present, past and future pilgrimage adventures — I’ve enjoyed celebrating pilgrim achievements and wincing at the occasional pitfall. What I’ve learned is that the trail is ever-changing due to weather and human-made changes, that it’s vitally important for pilgrims to follow the directions (!) and that pilgrim guidebooks are a group effort. The book really benefits from pilgrims’ actual experiences and I’ve taken many suggestions to heart in the new update I’ve prepared. So, make sure to follow the directions — and then send me your suggested book updates. Credential and testimonium — important new information about how to receive these. 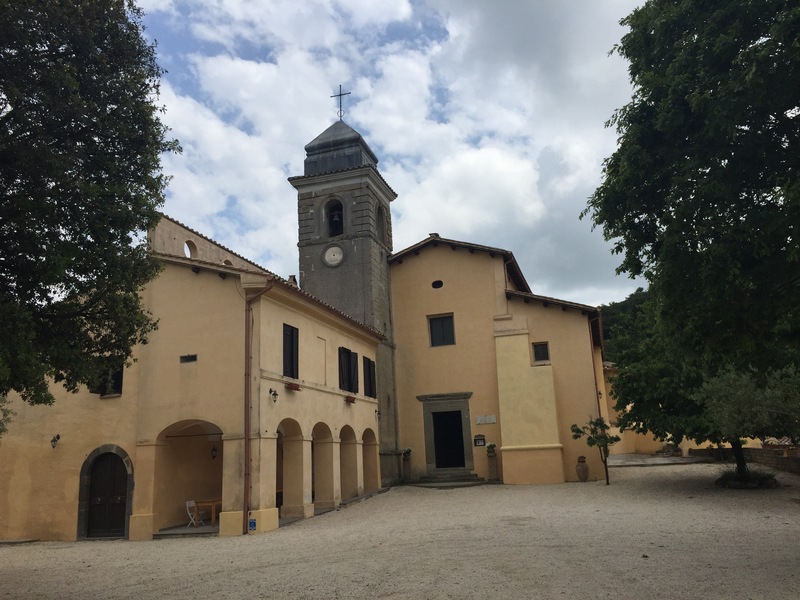 Additional directions for Pieve Santo Stefano to Sansepolcro — a logging operation has obscured the path and pilgrims have reported difficulty in the 500m after the Euro Hotel. These new directions should reduce confusion. Now for the important news. We have learned from pilgrim stewards in Umbria the very good news that this year the Via di Francesco route in Umbria will be combined with the route of Di Qui Passo San Francesco (sometimes known as “Angela’s Route”). This means that the large blue/yellow signs for the Via di Francesco and the painted yellow “Tau” signs for Di Qui Passo will be replaced with new way mark signs all throughout Umbria. In most cases the routes are already identical, but in some cases the two routes have diverged. Most importantly, the “Challenging Route” on Mount Subasio between Assisi and Spello will be replaced with Angela’s route. The “easy route” remains the same. Also, our guidebook’s route on the bike path between Trevi and Spoleto will become a formal, way marked, option for pilgrims who want to save a day and don’t mind missing Poreta. After Spoleto, the Via di Francesco route, which our guidebook follows, becomes the sole route and Angela’s route will be mothballed. We will post updates on the revised, combined route as we receive them from Umbria. It’s outstanding news that these routes will be combined. The fact that Italian pilgrim stewards are becoming more united in their trail markings is great news for pilgrims from all nations. 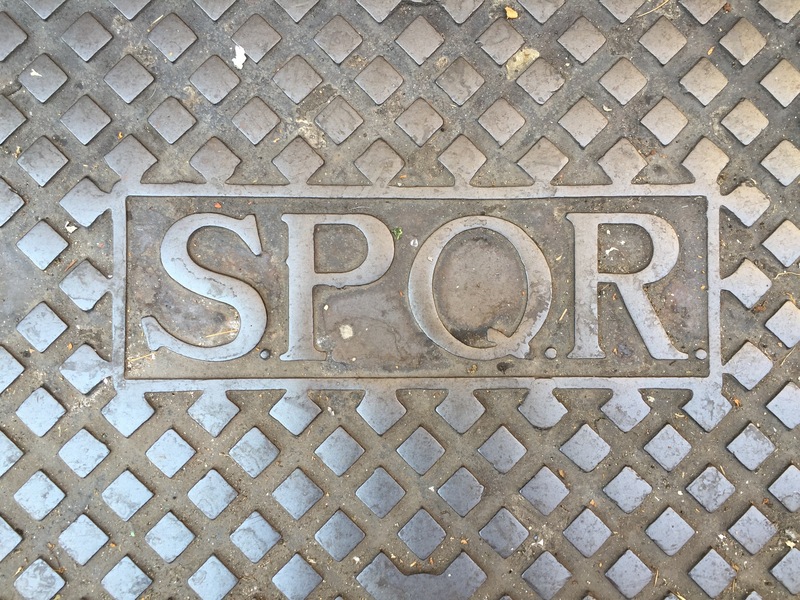 Roman street utility cover. Somehow even covered in grime there’s a certain majesty to it. 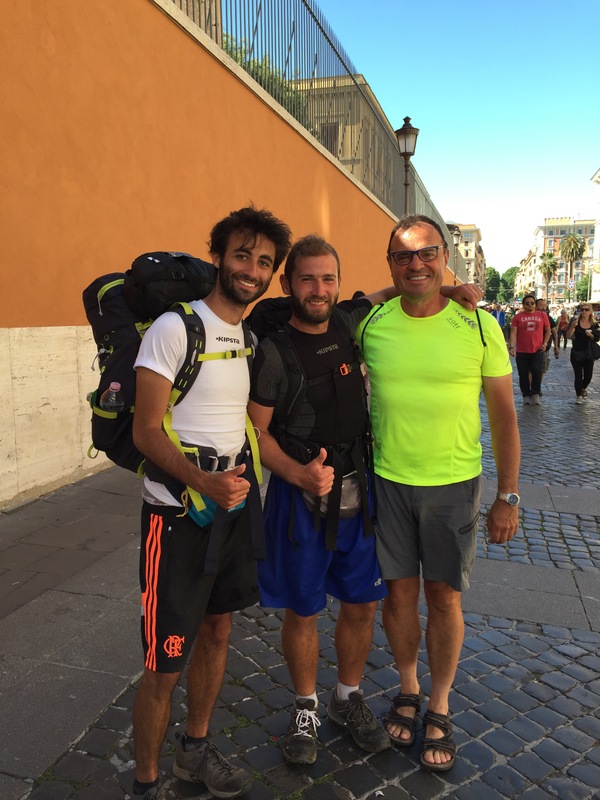 In 500 kilometers I walked less than a third of the 1700 km Via Francigena. I missed the days in England (though I visited Dover and Calais last year), all of famously unmarked France, expensive but beautiful Switzerland, and the mountainous northern stretches of Italy. But I did enough to confirm that the Via Francigena (VF) is one amazing walk. What surprised me most was that the VF track stops at some surprisingly lovely and memorable towns. 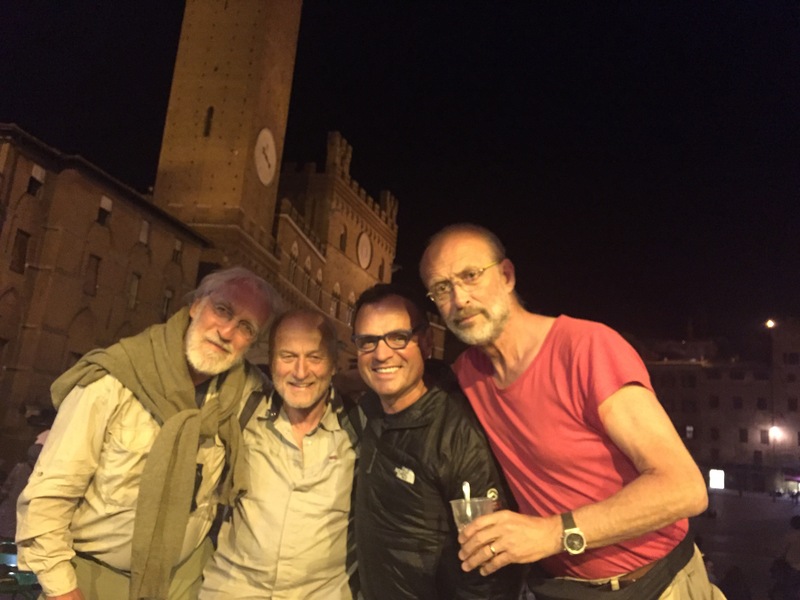 I’d expected to enjoy Lucca, Siena and San Gimignano. I didn’t realized I’d also fall in love with lesser known places like Piacenza and Monteriggioni and San Miniato and Formello. In fact, if an Italian town has an old quarter — a centro storico — I fall for it and I fall hard. Even industrial Viterbo, which I was ready to hate, has a charming center made of labryntine streets with little cafes and piazze that lend it that same irresistible charm. And even Rome. It happened again as I was walking through Piazza del Popolo onto Via del Corso on my way to do some shopping. I suddenly remembered I love this town too. I mean, I love it. When I came to Rome the first time it was on a bus tour. We were driven in and out of town as quickly as possible with warnings of “watch out for gypsies!” ringing in our ears. I can’t say I ever saw a gypsy, but I did get the impression that Rome was not a nice or friendly place. It wasn’t until I discovered Trastevere in April that I saw Rome’s softer side. What I saw in that charming Rome neighborhood was a Roman version of Italian village life, the relaxed and intimate daily routine that puts your life into the lap of your neighbor. You open your shutters in the morning and your across-the-street neighbor waves as she’s beating out her rug. You water the plants on your terrace and your behind-you neighbor asks if you’re going to the outdoor market later. You see the same people each day at the market and the cafe and the post office and the concert. You welcome the tiny intrusions into your privacy, knowing you are part of each other’s story. Italy does community so much better than America. Italians are very critical of their own country, but they’ve got an ingredient that we lost years ago with a suburbanization that is buried deeply under a thick layer of cocooning in front of the TV. As much as we love our privacy I believe we isolated Americans would love true community even more. This the kind of lifestyle we were made for, and even the gaping tourists are charmed by it. That’s not to say Italy is flawless. I admit to making a rude gesture or two into the rear view mirrors of Italian drivers who nearly ran me down on the thin white line that doesn’t suffice for a sidewalk. I found restaurant prices around famous landmarks in Siena and Rome to be fabulously unreasonable. Too much cigarette smoke in lovely outdoor cafes. Too few healthy food options for breakfast and lunch. Still, I love Italy, and the VF was one good, long baptism into its beauties. 0. April 25-26 Arrive Piacenza and rest day. Overnights Domus San Martino. A nice little boutique hotel in a very charming Italian town. I chose to start in Piacenza due to its favorable rail connections and proximity to a major airport (Milan) near the northern stretches of the VF. 1. April 27 Piacenza to Fiorenzuola d’Arda (32km). Overnight Ostello Parrochia San Fiorenza. I was alone in this very basic, donativo hostel of about six beds above the school yard. I learned that this stretch of the VF is quite flat, mostly in asphalt, well-marked but somewhat monotonous. 2. April 28 Fiorenzuola d’Arda to Fidenza (22.5km). Overnight Affitecamere al Duomo, a private guesthouse with simple bedrooms and shared kitchen and bath. On this day I injured my right ankle and had a painful walk to get into Fidenza across miles of asphalt, zigzagging through the countryside to avoid the busier roads. A seldom discussed disadvantage of asphalt walking is the “crown” of paved roads, which are designed to drain water to the edges. Walking all day against traffic, as is recommended, means repetitive stress from the road camber, which I think exacerbated my foot problem. 0. April 29-30 Parma rest and recuperation days. Overnights Astoria Residence Hotel. I limped to this budget hotel by the train station and learned my actual townhouse-sized room was in another building about a half mile away. Fortunately the hotel had loaner bikes, and an old one-speed became my ticket to mobility. Parma is very nice. And the cheese…..
3. 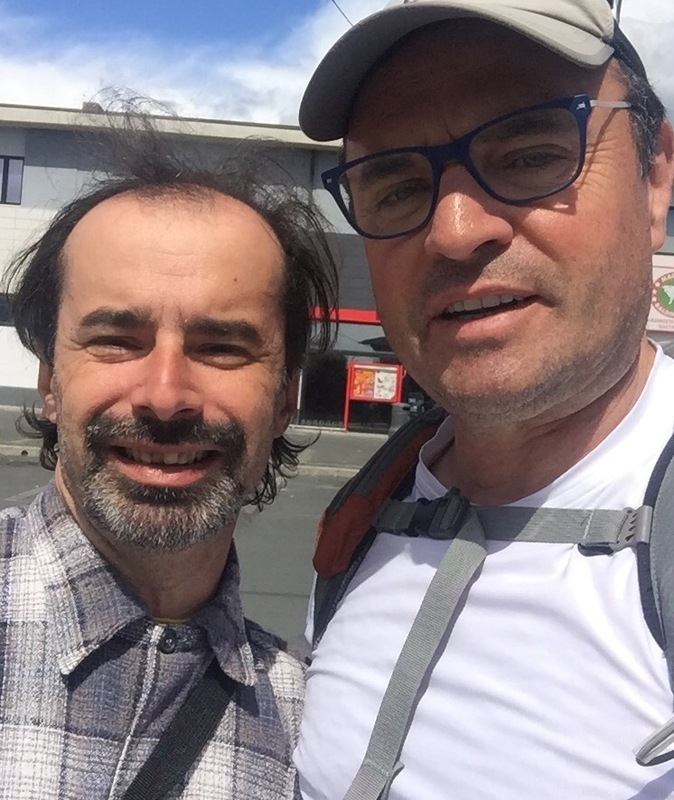 May 1 – Train to Sarzana; Walk Sarzana to Avenza. Overnight B&B Giardino Antico. Still favoring my foot, I wasn’t quite ready to head back to a hostel. Once I found this little B&B with its friendly and helpful hostess, I was very happy with my choice. 4. May 2 – Avenza to Pietrasanta. Overnight Ostello San Pietro — basic, but one of the few hostels on the VF with a green lawn. Another cute, small Italian town. This one sporting a large and sunny piazza. 5. May 3 – Pietrasanta to Lucca. Overnight Ostello Misericordia, Lucca. Such a long walk into Lucca, and the VF frustratingly skipped nearby neighborhoods with cafes and stores. Nice hostel with double rooms and a kitchen. 0. 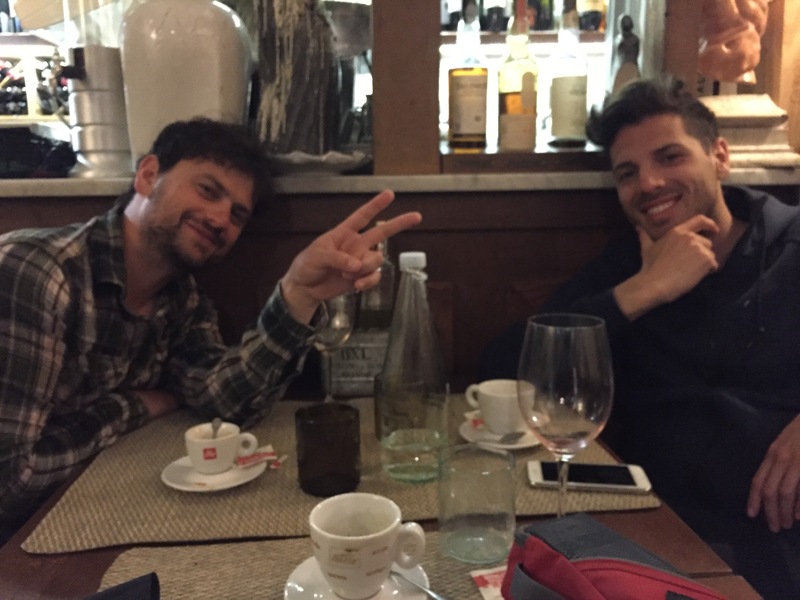 May 4 – Rest Day in Lucca. Overnight Camere con Visto. Since hostels allow pilgrims only a one night stay, I booked a room at this great little spot very near the Duomo and across from one of Lucca’s top restaurants. I felt a little guilty about a rest day in Lucca, but I loved the town and am glad I tarried there. 6. 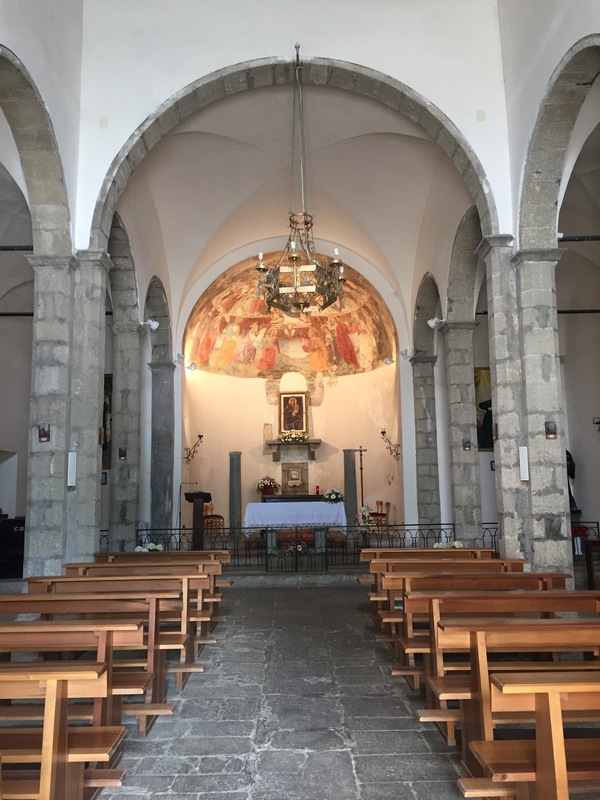 May 5 – Lucca to Altopascio. Overnight Ostello Cavallieri di Tau. Once I found the hostel it was back to the library to check in and get keys. Here the old piazze seem deserted and the action takes place out in the new piazza with all the cars. A great bakery there, though, with a cafe that opens at 04:00 and good wifi. 7. 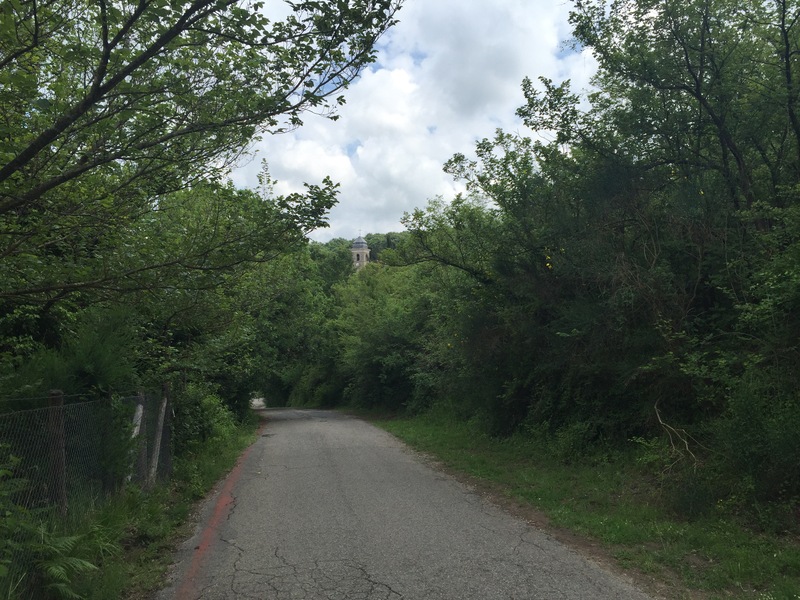 May 6 – Altopascio to San Miniato. Overnight Convento San Francesco at San Miniato Alto. Even with GPS working I found it difficult to locate this convent. Once I found it though it was a charming arrangement, with pilgrim rooms right above the cloister. There’s a nice sense of community with the friars and their volunteers, but I never did have time to climb the big tower that can be seen for many miles. 8. May 7- San Miniato to Gambassi Terme – Ostello Sigerico. Though a mile shy of the actual town, the deficit was made up by the excellent volunteer hospitaleri and the detailed tour of the adjoining historic church. Two bars catering to pilgrims, the first with some crazy good calzones. 9. May 8 – Gambassi Terme to San Gimignano – Monastero San Girolamo. I got the feeling that the town’s other pilgrim hostel was the happening place, but I scored a private room here and had a good conversation in Italian with the smart and friendly head nun. 10. May 9 – San Gimignano to Monteriggioni — Castello Casa per Ferie Santa Maria Assunta. This hostel is the only show in town, and if the priest is away, getting a key to it is no easy feat. Once in, it was a perfect place to rest and enjoy the tiny, walled village with its two cafes. Remember that there’s no store in town and the cafes open late. 11. 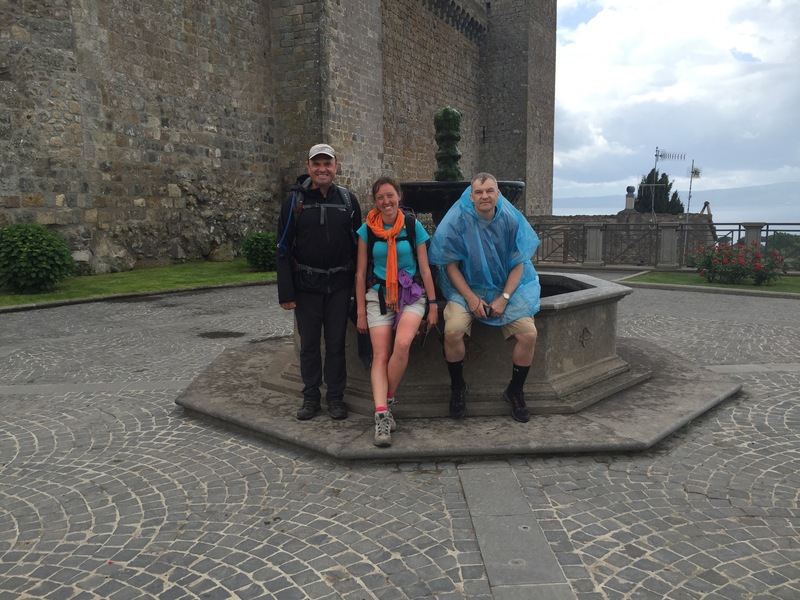 May 10 – Monteriggioni to Siena — La Mercato B&B. I never liked hostels in big cities, so I booked this B&B just off the Piazza del Campo. It was a good find in spite of the chilly breakfast attendant. Siena’s cathedral? One of the most spiritual places I’ve ever been. 12. 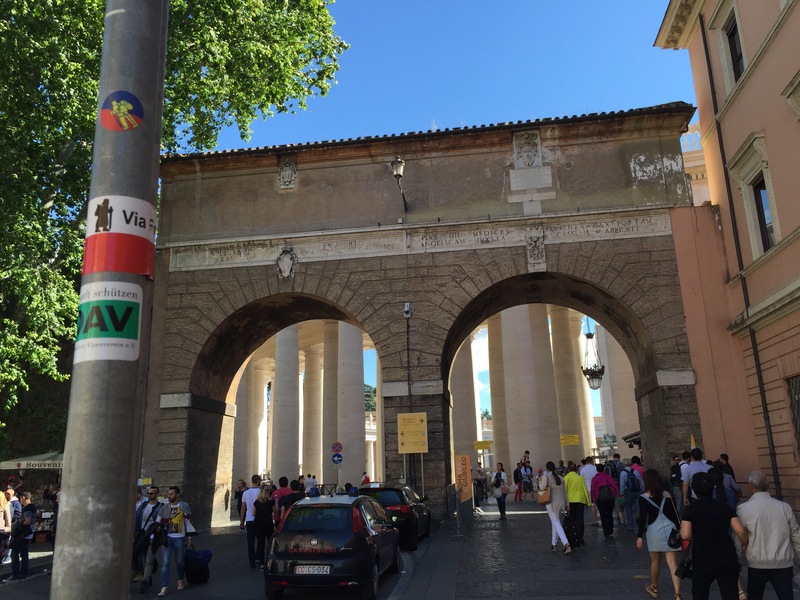 May 11 – Siena to Ponte d’Arbia — Hostel at Centro Cresti. The only lodging mistake I made. I switched rooms because I believed the floor under me might literally cave in. The hostel itself sits right on a highway and the only access to town is across a dangerous bridge. Next time I will walk the few extra km to Buonconvento, a charming town with more to do and see, whose hostel just had to be better. 13. May 12 – Ponte d’Arbia to San Quirico d’Orcia — La Palazzuolo Hotel. With wet boots and rain gear I was in no mood for another hostel, and I can’t believe I found this room in a nice hotel above the historic center for €50. Everything was dry by morning! 14. May 13 – San Quirico d’Orcia to Radicofani — Ospedale degli Santi Pietro e Giacomo. After the tortuous climb up to Radicofani the hostel was a delight. Within minutes of calling the number on the hostel door I was met by my host and led into the centrally located and historic building. Two bathrooms, plus a small kitchen. 15. May 14 – Radicofani to Acquapendente — Quasi Toscana B&B. Friendly Roberta was my hostess and her guest room had the personal touch of someone who takes pride in her home. I’m glad I arrived in time for the Infiorata, but sad the displays were rained out. 16. 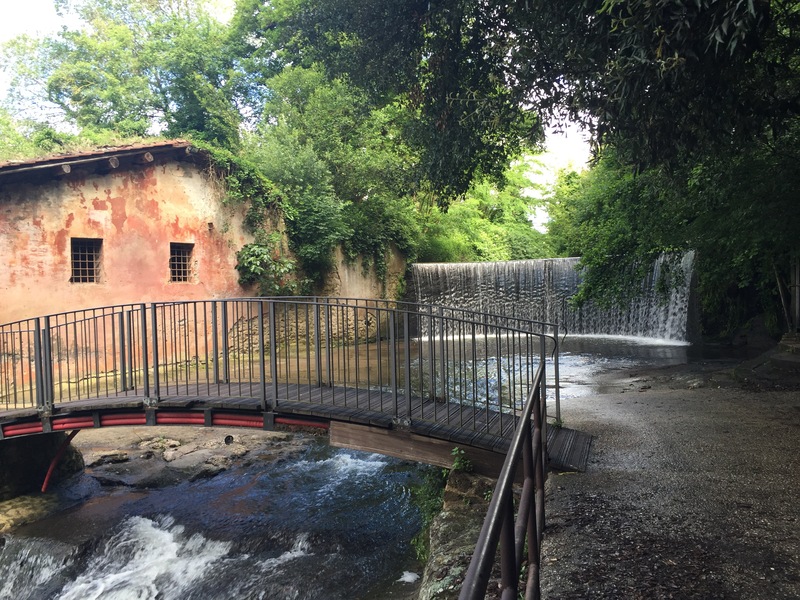 May 15 – Acquapendente to Bolsena — Casa Preghiera di Santa Cristina. Everyone else opted for the other hostel in town, ending up sleeping on mattresses on the floor. So this entire hostel was shared by just three of us. Nice hostess, good bathroom and kitchen facilities. 17. 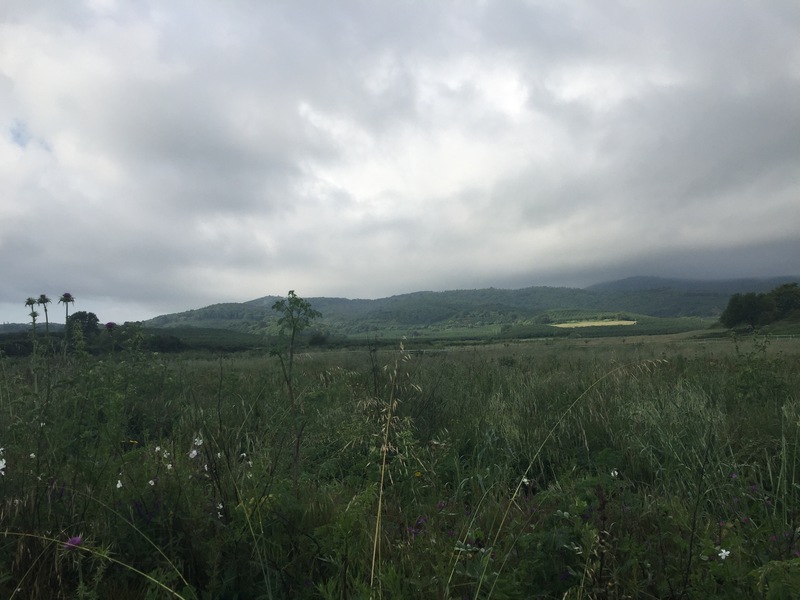 May 16 – Bolsena to Viterbo — Overnight in Piegaro. After walking the 30ish km to Viterbo I hopped on the train to my friends’ house near Lago Trasimeno. If you’re looking for a central place to park yourself while touring Umbria, choose the Antica Vetreria in Piegaro. Tell them Sandy sent you. 0. 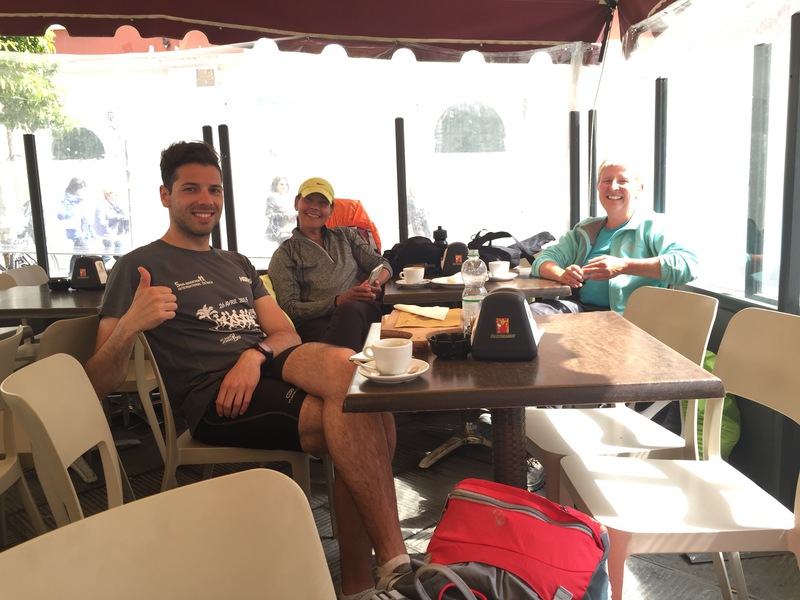 May 17 – Rest day, Piegaro. Overnight B&B Orchard, Viterbo. This was a true gem, and the host, Matteo, was beyond nice. Located in the old city, it was a good home base to explore Old Viterbo. 18. 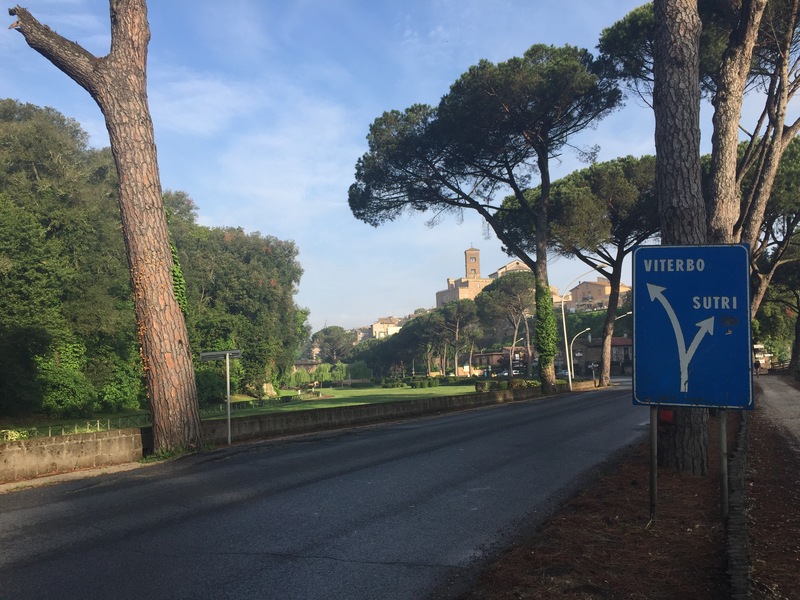 May 18 – Viterbo to Sutri. Overnight Hotel Sutrium. Just off the main piazza, I scored with a room facing the back side. Very basic, but handy and comfortable enough. Because I forgot to pay before I left and the hotel owners didn’t know how to make my credit card info work via telephone it took awhile to sort out the bill. Since I can’t do an IBAN transfer like a European I asked my friend Sebastian in Cologne to send the money via his account. Lesson: even if you give your credit card on booking.com don’t assume the hotel has used it to bill you. 19. 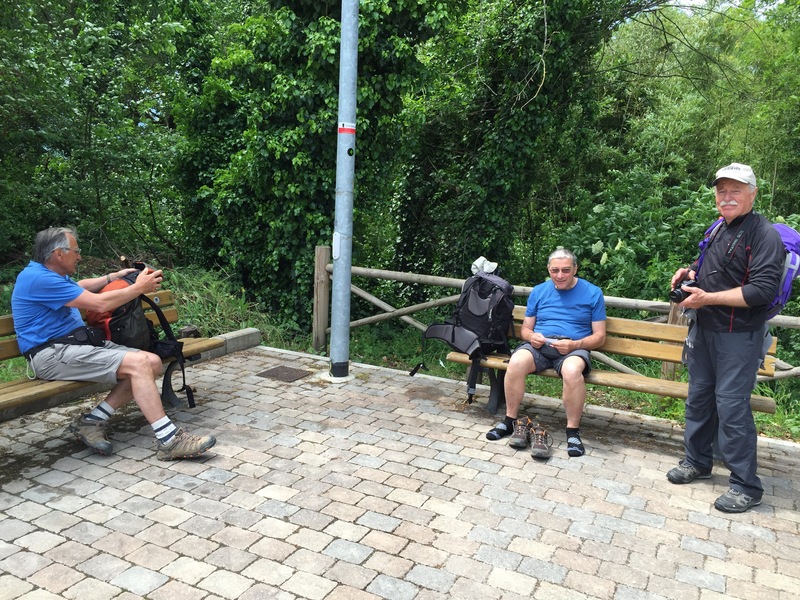 May 19 – Sutri to Formello. Overnight La Francigena Casa Vacanza. I loved this little house. Right on the trail in the pedestrian zone. Heated. I had a hot bath! 20. 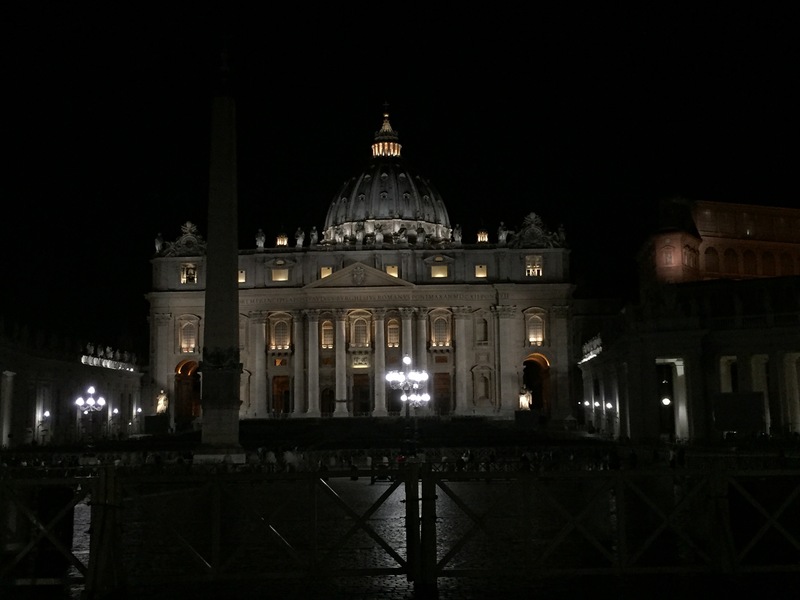 May 20 – Formello to Vaticano. Overnight Air BnB. Everything was full by the time I started looking, and I was surprised to discover that Rome’s pilgrim hostel does not take reservations. You’re supposed to show up at 15:00 and stand in line for a bed. Knowing I’d be late after a long walk I took the safe route and found a place on AirBnB. A note about Guidebooks: I came to Italy armed with every English language guidebook I could find, all of which fit neatly inside my phone. I expected the Lightfoot guide to be most helpful, but then came to realize it is purely directional guidance and accommodation listings with scant information about historic towns or buildings. It’s like being told how to get there, but not knowing where you are once you arrive. I found the Cicerone guide by Alison Raju to be difficult to read in its Kindle form and understood its layout better when I peeked at a hard copy. Alison’s place descriptions are unparalleled and alone make purchase of her guidebook worthwhile. The SloWays App is an extremely helpful tool, connecting GPS guidance with downloadable maps. Sadly, my phone’s GPS function failed, so the app became almost useless. The daily descriptions are so vague as to be pointless, and SloWays sticks slavishly to the official route adding unnecessary km to the unwary pilgrim. I ended up relying mostly on the somewhat obscure (for non-Italians) Terre di Mezzo guide. It is unafraid of route-shortening options, has passable directions, and includes interesting historical info. The maps are not wonderful, but GPS tracks are available. After my phone broke I wished many times I had brought my GPS and Terre di Mezzo’s tracks. And how did I do? I’m glad you asked! After recovering from my foot injury I chugged along pretty well. My last week was blister free once I learned the right formula for tying my boots. As always I lost weight and got too much sun. My rain gear was fine when I used it, but it’s uncomfortably hot, even on cool days, so I tend to avoid wearing it unless I absolutely must. This led twice to me getting my boots wet on the insides. Not good. Once again, a true highlight was pilgrim friendships. There were few solitary walkers, though, and those who weren’t in couples were either slower (Mike) or faster (Paolo) than me. I leave you with these photos of pilgrim friends. Ciao! Walking through the nature preserve at the start of the day in one word: Paradise. I arrived today in Rome, and rather than a long winded post I’ll share instead a series of photos and captions that describe the day. I’d have happily spent more time in the pedestrian zone of lovely Formello., my home last night. Stuck inside the stockades on the long and winding wrong road in paradise. A pretty bridge in this paradise of a nature preserve. The only problem? I was lost. Hell under the Umbrella Pines. Many long kilometers of walking on the road into Rome. Two Dutch pilgrims at the overlook at Mons Gaudi. Very sweet, and generous with their fruit. Can’t believe my luck. i’m walking to the Vatican to get my Testimonium just as pilgrim friends Roberto and Stefano are about to enter St Peter’s Square. They were out of blank Testimonia at the Pilgrim Office, so I convinced the official in the Sacristy to write mine by hand. He mispelled my name, but that makes this one even more special. Inside St Peter’s, designed as an image of Heaven on Earth. Joy. A fantastic walk over many days. Full of memories. Leaving Sutri behind in the sunshine. At 10:30 today I made a choice that I immediately knew was a mistake. I said “no” to the simple question: shall I put my rain gear on? Within 10 minutes I was completely drenched, including inside my boots, which will take days to dry. The only good thing? Tomorrow is the last day I’ll need them. This rainy cloudy day began in the sunshine. I was down at Hotel Sutrium’s breakfast room by 7:00 and helped myself to a breakfast of sweet bread, yogurt, juice and coffee, then I was out the door at 7:30, ready for another 30 km (18 mile) day. The distance is a little longer than I’d rather walk, but after Viterbo there were 90 km left to go, which the guidebook split into days of 25, 25, 25 and 15 km. That meant four days for 90 km, which I was confident I could do in three days of 30. That’s eight hours per day of walking, but I’m in the groove and not really worried about the exertion. I hadn’t really thought about that since I was just planning to follow the guidebook’s directions and make the distances as direct and short as possible. But before long, as predicted, there I was on the road. By road I mean the Via Cassia, the same road followed in various forms by the Via Francigena for hundreds of kilometers from Northern Italy. 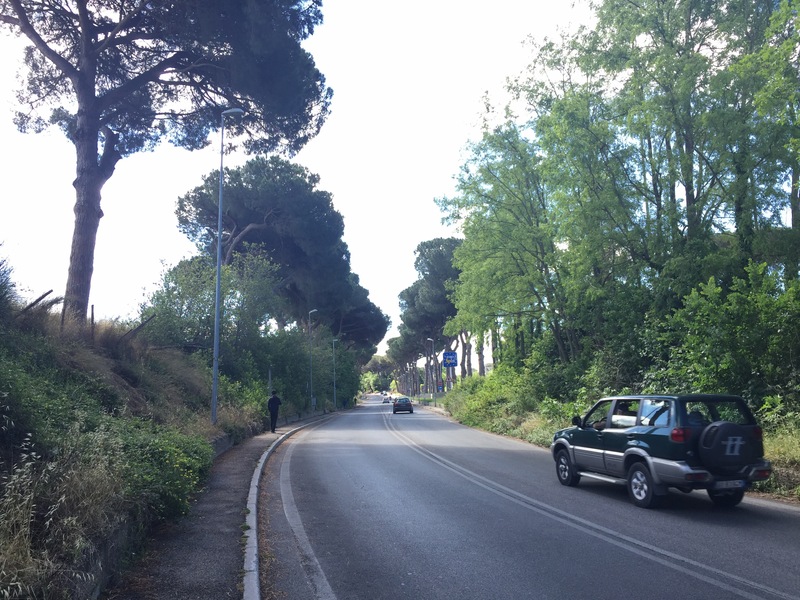 I came to discover, though, that the Via Cassia this close to Rome is a four lane, access controlled freeway. Walking on the road would mean walking in the feeder/distributor lane next to the freeway, in tractor paths alongside the freeway, on old stretches of the former Via Cassia beside the freeway, and in some cases right next to the oncoming traffic on the freeway. If it sounds perilous, believe me it was. But perilous became ridiculous when, walking alongside the freeway it started to rain. Cats and dogs rain. Buckets. Torrents. And there I was, as the first raindrops fell, beside the highway having decided the rain wouldn’t last and — I would not put on my rain gear. Any veteran long distance walker will tell you the biggest problem of rain is getting the insides of your boots wet. Wet boots mean wet feet. Wet feet mean blisters. And wet boots may stay wet for days if there’s not a good way to dry them out. As the rain let up and I walked along the road to Campagnana di Roma I heard the fateful “squish, squish” of my feet inside my boots. Well, I did have my sandals along. When I made it to Campagnana at about 1:00 I found a pizzeria near a cafe, settled down to a lunch of hot tea and pizza, took off my boots and socks, and let my feet sit in the breeze on the cold pavers of the piazza so they could dry. After lunch I put on my warmest wool socks and my sandals (deduct style points) and strapped my dripping boots onto the back of my pack. Madonna della Sorba tower peeks through the trees. And then everything about my day changed. The road between Campagnana and Formello was gentle and quiet, leading via the sanctuary of Madonna Della Sorba to the charming town of Formello where I’m spending the night. With the rain gone, my feet dry in my sandals and the road quiet and calm, my mind started to make a shift. I started to enjoy the day. Then I went deeper. I started to enjoy the walk. Then my mind started to open up. I thought about this beautiful month I’ve had, and I gave thanks. I thought about Theresa, my beloved back home, and gave thanks. I thought about my kids and my old and new churches, about my friends and about many issues. And I felt a warmth coming over me, a sense of well being, of gratitude and joy. A young swineherd with a mangled hand was out watching his pigs one day when he noticed one pig stray from the group, walk into the woods, and return an hour later. It did this each day until finally the boy decided to follow it to see what it was doing. He found it on its hind feet, standing up against the trunk of a sorba tree (hence the sanctuary’s name), worshiping at a small icon of the Virgin. The boy ran to the village to tell the people what he had seen. No one believed him, but when he put his mangled hand into his pocket, he pulled it out and discovered it was completely healed. The startled and suddenly convinced villagers built a shrine around the tree, and the icon worshiped by the pig hangs behind the altar of the church that remembers the miracle. The long, quiet (and dry) walk to Formello. So a day that started in a ridiculous manner ended up being one of the most precious. It turned from a mistake into a meditation. A little miracle of centuries ago and a quiet walk reminded me of the miracles in my own life. I had dipped myself into this quiet vale with its hidden shrine and when I came out I was restored. In the apse, the original icon that spawned the miracle. 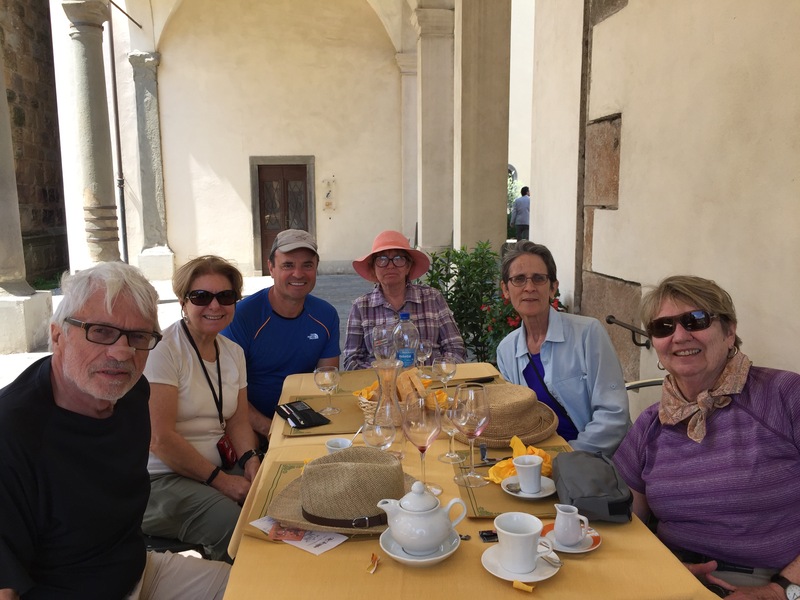 I’m thrilled to be offering old and new friends the opportunity to walk with Theresa and me from Assisi to Rome September 3-15 of this year. I’m working with my friend, Bret Thoman of St. Francis Pilgrimages, and we’ve put together a super itinerary for our group. You can download the PDF and registration form here to learn the details. Suffice to say, it will be the walk of a lifetime. Since our brochure didn’t have enough room to show some of the most amazing photos of the walk I thought I’d post photos to whet your appetite! The pics come from either my 2013 or 2014 hikes. I’ve also added a little text to explain more of what the days’ journeys will be like. September 3: Arrival in Assisi. Meet Theresa and me along with fellow pilgrims at an orientation session in St. Francis’ lovely hometown. There’s a pilgrim mass each evening in the lower Basilica of San Francesco, so we’ll enjoy that before having a fine dinner together inside beautiful and beloved Assisi. If you’d like to explore Assisi a little more, you should plan to arrive a day or two early. We can help you make arrangements to have a guided tour of town, or you can simply walk and discover. Enjoy the churches, museums and castle of the town, or just enjoy the Italian sunshine and amazing views to the valley below. September 4: Assisi to Spello – 11 miles. Spectacular views of the Tiber River Valley greet us as we walk along the slopes of Mount Subasio to beloved Spello, a hill town famous in its own right. On the way we visit Francis’ beloved Carceri Hermitage then relax for lunch or a beverage in Spello. Since the scenery would be very similar for the next two days of the walk, we skip two stages ahead to sophisticated Spoleto, whose historic cathedral holds one of the few handwritten notes of St. Francis (Overnight Spoleto). Option: Avoid the first stiff climb up Subasio with a taxi ride to the Carceri Hermitage where you rejoin the rest of the group. September 6: Macenano to Piediluco – 15.5 miles. We walk through farms and pastures to majestic Marmore Falls and serene Lake Piediluco, where St. Francis preached. A climb up to the tiny hill town of Labro gives a peek into life in a medieval village untouched by time. A private van carries you three miles from the shores of Piediluco to the hill town of Labro (Overnight in Labro). September 7: Labro to Poggio Bustone – 10.5 miles. We leave behind high pastures and walk up to the St. Francis Birch Tree, where tradition says a beech tree protected St. Francis during a harsh winter storm. Walk downhill through lush forests to the hill town of Poggio Bustone, site of the spiritual transformation that began Francis’ ministry (Overnight in a comfortable Poggio Bustone pilgrim hostel). Poggio Bustone dangles on a steep mountainside and its narrow streets are little changed in centuries. September 8: Poggio Bustone to Rieti – 11 miles. — A quiet and green walk through the gorgeous village of Cantalice and then the Franciscan sanctuary of La Foresta where legend attributes a key miracle to St. Francis. The day ends in nearby Rieti, capital of the Sabine olive-growing region of Italy and itself an historic Roman town (Overnight in a Rieti hotel). Theresa and I loved quiet and scenic Cantalice, with its winding alleys and hidden piazzas. Option: Rieti/Greccio guided tour. A local expert guides you through the Underground Rieti Salt Road and takes us in a private van to the nearby Franciscan sanctuary of Greccio, the scenic mountainside convent where Francis and local villagers created the first Christmas nativity scene. (Overnight in a Rieti hotel). September 10: Rieti to Poggio San Lorenzo – 13.5 miles. Walk along the Roman Salt Road through quiet farms of the Sabine Region to the tiny, Roman village of Poggio San Lorenzo (Overnight in Poggio San Lorenzo). 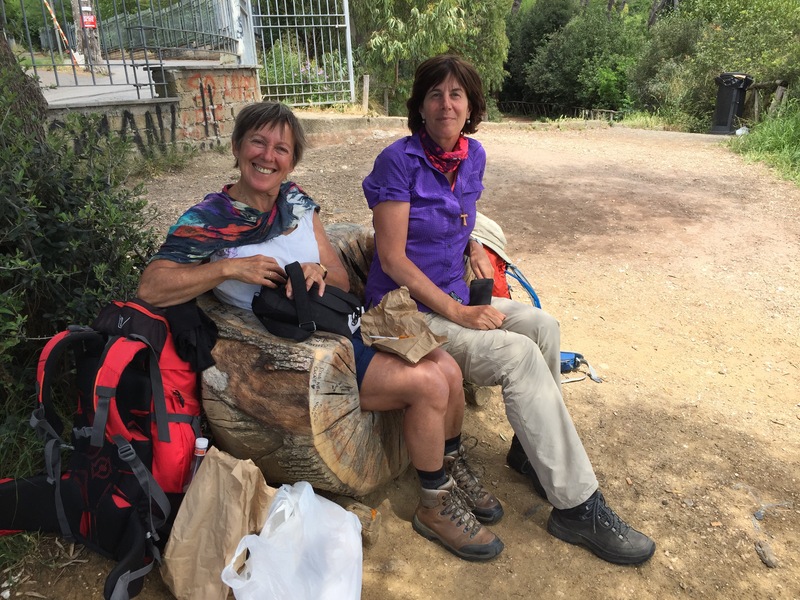 This is a mostly flat day’s walk and the scenery of woods, farms and olive groves is much different from the previous days’. September 11: Poggio San Lorenzo to Ponticelli –14.4 miles. A day of forested ridges, olive groves and sheep pastures with views to castles and quiet villages (Overnight in Ponticelli). The word “undulating” is best to describe the terrain here. With a combination of rocky soil, lots of sun, and regular rain, olive oil from the Sabine area is prized among Italian varieties. Most of the non-agricultural areas are protected forestland, meaning the day’s walk is quiet and far from automobile traffic. September 12: Ponticelli to Montelibretti – 8.2 miles. Forests and olive groves punctuate today’s walk, with constant views of towering Castello Orsini on one of the nearby forested mountaintops (Overnight in Montelibretti). The Orsini family was a powerful, medieval clan of Roman nobles and their castles and secured the Sabine area and reminded visitors of the power of nearby Rome. Today the castle is restored as an opulent hotel, whose grounds include a lovely swimming pool and excellent restaurant. 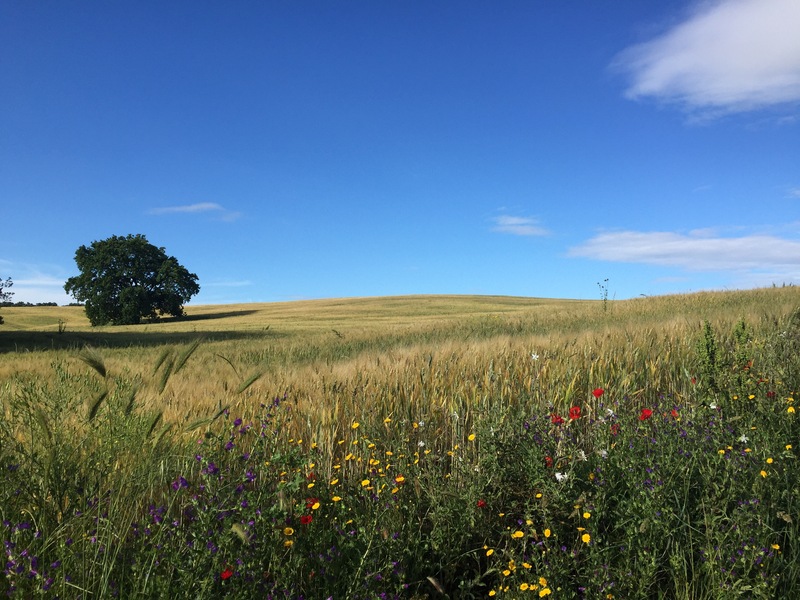 September 13 Montelibretti to Monterotondo – 10.3 miles. 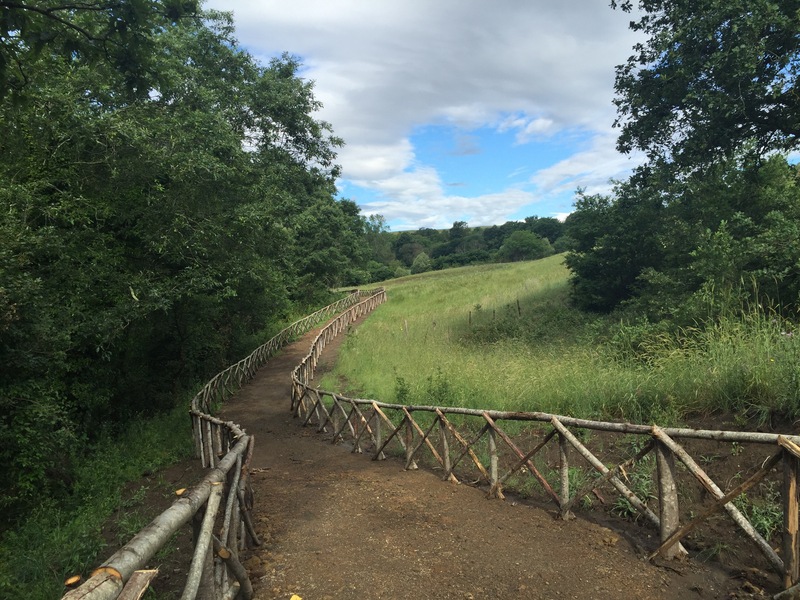 With Rome near, the territory changes to olive groves and vast fields of grain as you walk through the Gattaceca Nature Reserve. In clear weather the first glimpse of St. Peter’s is visible in the far distance. 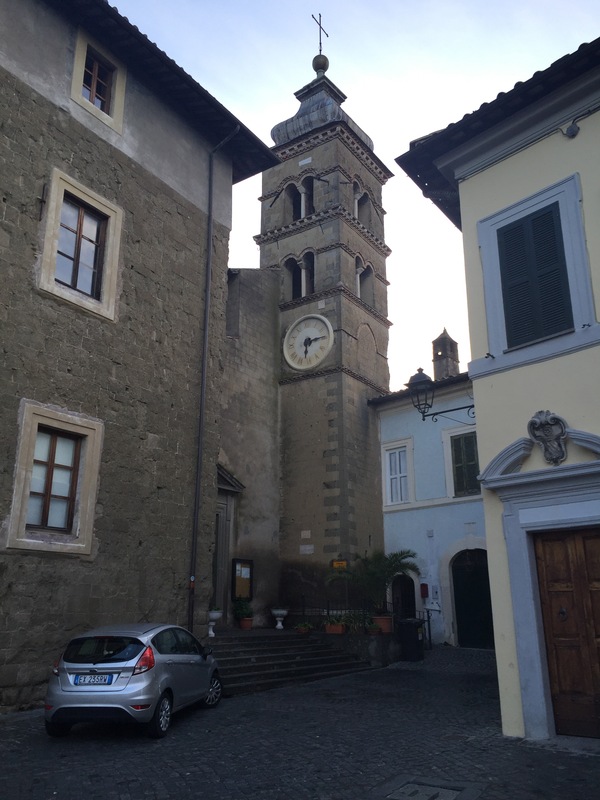 Enjoy an evening stroll (passegiata) through the delightful Old City (Overnight Monterotondo). 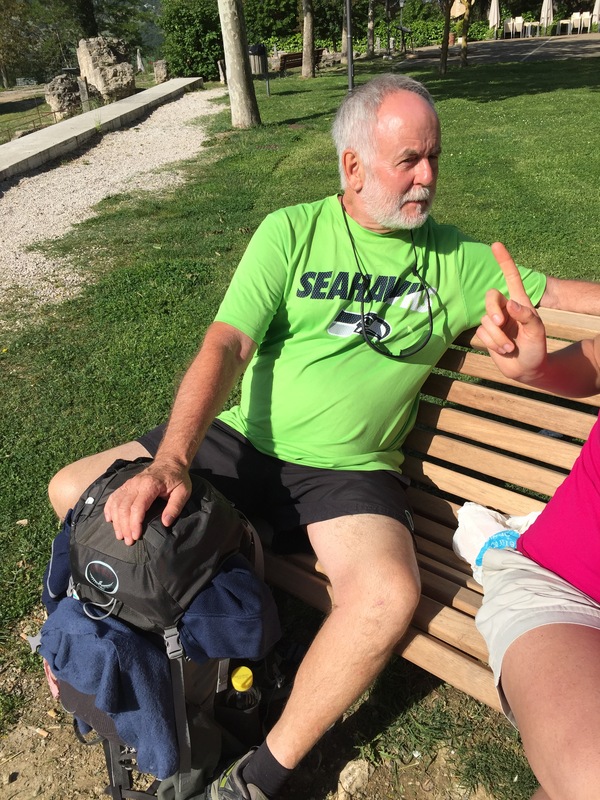 September 14: Monterotondo to Monte Sacro – 12 miles. 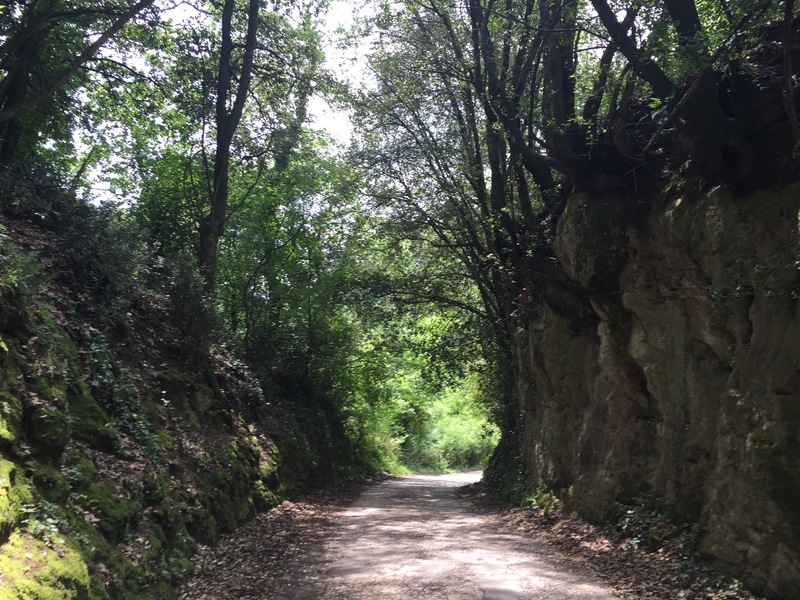 After half a day’s walk in the peaceful Marcigliana Nature Reserve you will follow sidewalks into the outskirts of urban Rome (Overnight Monte Sacro). The path carefully avoids the congestion of Italy’s largest city and allows a quiet walk through small and large farms. 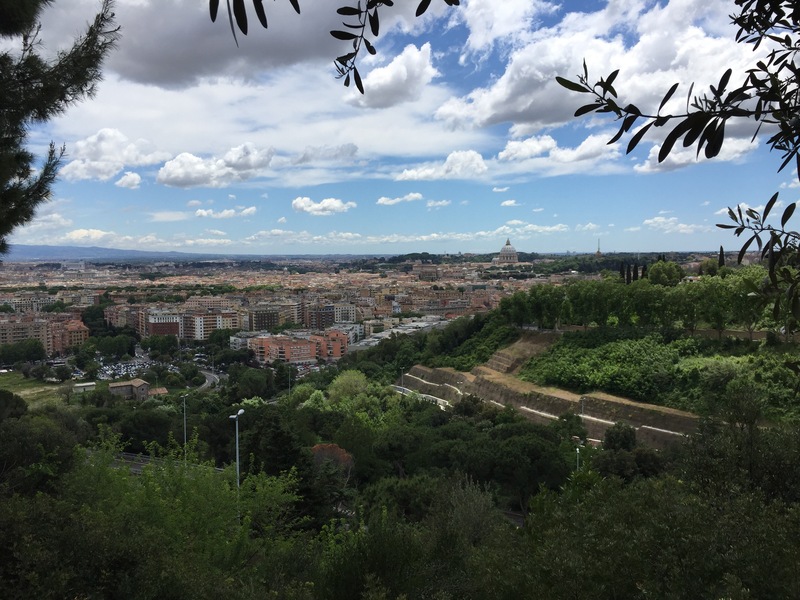 The transition to the outskirts of Rome is abrupt and for the first time on the trek we walk sidewalks next to busy streets — with ample gelato stores along the way! 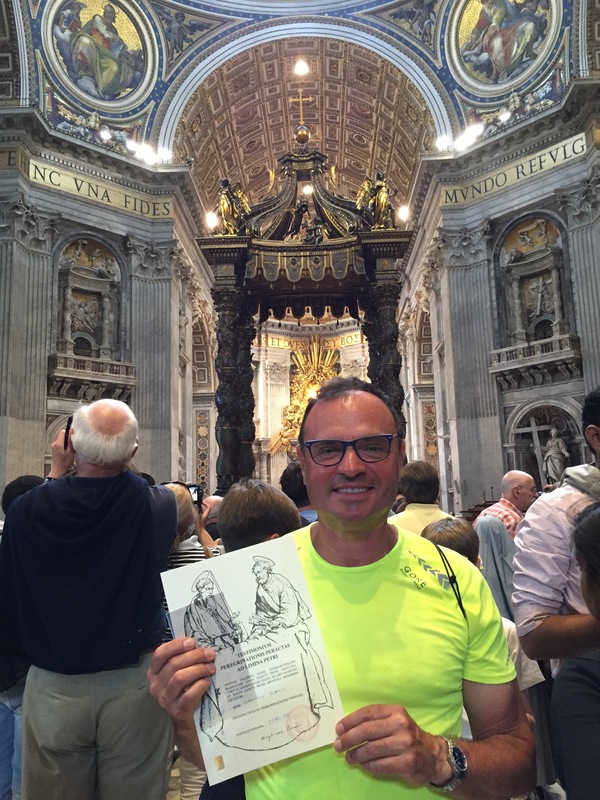 September 15: Monte Sacro to Vatican – 9.5 miles. Though Rome is bustling around, you will share quiet paths with bicyclists and strollers along the Ariane and Tiber riverfronts until rounding a bend in the Tiber at Castel Sant’Angelo for our final entry into glorious Vatican City. It’s the Holy Year and we will have reservations to walk through the Holy Doors of St. Peter’s Basilica. Pilgrims share a final dinner together at a delightful Roman restaurant (Overnight Rome). Will you plan another day or more to enjoy Rome? We still have a few places available on the trip. I hope you’ll join us for what will certainly be an unforgettable trip!